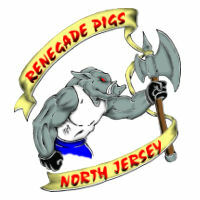 The Renegade Pigs Motorcycle Club is a non-profit national organization comprised of active and retired public safety officers who share the common love of riding their American made motorcycles, and who believe that loyalty and camaraderie are core values for public safety personnel. We do not believe in politics in public safety, but rather in doing what is right and being loyal to our professions. We are active in numerous charitable causes and fundraising efforts, particularly those benefiting public safety personnel and children. There are currently over 40 chapters in 16 states and Washington DC, including three in New Jersey. 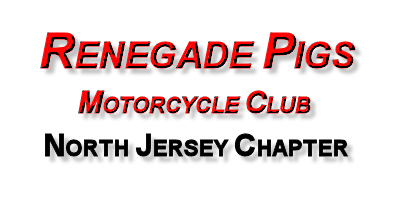 In July of 2001, we joined with many of the other Wild Pigs chapters in the Northeast in forming the Renegade Pigs Motorcycle Club. Since then, the Renegade Pigs have expanded across the country. The North Jersey Chapter remains one of the largest, with members either active in, or retired from, all areas and levels of law enforcement. We have maintained a continuous tradition of charitable service to the community. The centerpiece of the chapter's fund-raising efforts is its annual charity party, held each year in May on the weekend after Mother's Day. Since 2002, we have dedicated our party to the memory of departed North Jersey Chapter members. The Chapter also holds a club-only ride each September to commemorate North Jersey member Paul "Axe" Laszczynski, a Port Authority Police Officer who was lost in the World Trade Center attacks on 9/11/2001. When you see our colors on local roadways, know that you are riding or driving next to loyal and dedicated public safety professionals. Please remember to support the brave men and women who protect and serve our communities.